This pasteprint once simulated a low-relief object made out of gold. Pasteprints were made in South Germany between about 1455 and 1525 and served a growing market for cheaper goods imitating luxury products. Over time the raised areas have broken off and the remainder has discoloured. The dark areas here would have been sculpted tin foil, glazed to imitate gold. The white lines would have been the highest areas and might have been picked out in black ink to show off the design. This pasteprint also has traces of pink pigment on the faces and hands and in each corner. This design shows the Annunciation with the Archangel Gabriel and the Virgin Mary. The patterned background includes archways and several banderoles (curling strips) containing text representing speech. The scene is a mirror image to normal, with the Virgin on the left, suggesting that this pasteprint was moulded from a cast of a metalcut. Once thought to have been made from paste, pasteprints are now known to have been made by pressing alternate layers of wafer-thin tin and resin into the grooves of a metal plate cut with a design and punched with patterns by means of tools or stamps. A cast from a metalcut was sometimes used instead. This 'sandwich' of foil and resin was then turned over and the flat side of the layers pressed onto paper, possibly using heat. When the metalcut plate was removed, it left a contoured layer of resin overlaid with tin leaf stuck onto the paper. To simulate gold the maker painted a coloured glaze over the tin. The design could be enhanced using printing ink to pick out the lines and by applying colour to areas such as faces and hands. Only around 200 of these objects survive in the world, often surviving, like this one, stuck to the inside of book covers. 'Pasteprint' on laid paper. See object history note. The subject matter is The Annunciation, with the Virgin Mary appearing on the left. There are speech banderoles above, below and between the two figures. Behind is an architectural framework of four arches. The background is decorated all over with diaper (diamond) pattern and both the Virgin Mary and the Archangel Gabriel have elaborate haloes. 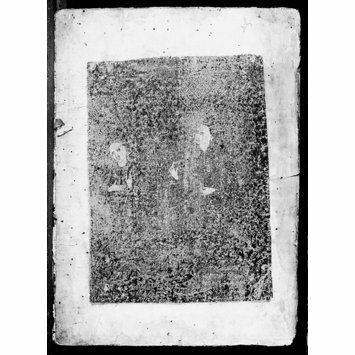 They stand on what appears to be a tiled floor. The image can be read from a pattern left by remains of the substances used to create the print. The faces and hands of the two figures have the remains of a pink pigment which makes them more easily readable than the surrounding areas. Similar spots of pigment can also be seen in each of the four corners of the print, suggesting coloured decoration in the corners, not easy to discern. Red and black lines are from resin once or still attached and discoloured. In some areas a white substance is attached to the black, which could be oxidized foil, based on the make-up of other surviving pasteprints. 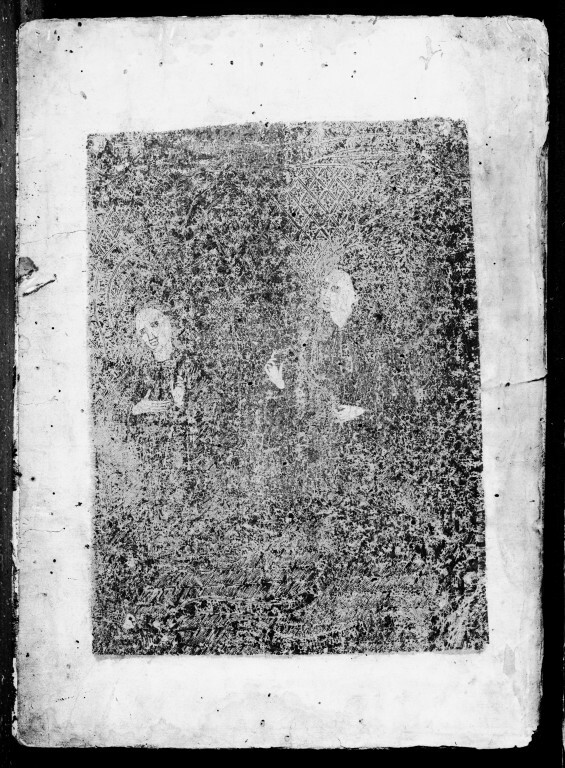 Analysis is needed to confirm material make-up of this print. The print is adhered to the pastedown on the inside of a book board. The book board is wooden and has fragments of 4 laced-in alum-tawed tapes and headband tie-downs. Turn-ins appear to be vellum. The inner hinge consists of a fragment of re-used manuscript. The term pasteprint is used because scholars originally thought that the objects were actually made with paste, rather than the resin being a medium by which foil was able to adhere to the paper. This print looks very different from the way it would have appeared originally because of discolouration, losses and deterioration of the materials used to make up the print. Pasteprints were low-relief objects made from foil moulded by use of a metalcut and adhered to the paper by resin. Sometimes the tin was glazed to resemble gold with some areas of the design picked out with ink and pigments. The print is adhered to the pastedown on the inside of a book board, which is one way in which such prints have managed to survive, despite their deterioration. Stuck on a piece of wood which once formed the front board of a book. Pasteprint mounted on wooden book-board; The Annunciation, South-West German, last quarter of 15th century. Coombs, E., Farrell, E., Field, R.S. Pasteprints: A Technical and Art Historical Investigation. Cambridge, Mass., ca. 1986. Bertalan, S. 'Medieval pasteprints in the National Gallery of Art', in Conservation Research, Studies in the History of Art. 41, Monograph Series II, Washington National Gallery of Art, 1993. Bowman, C.L. 'Pasteprints: A New Hypothesis about their Production', in Print Quarterly. Volume II, Number 1, March 1985, pp. 4-11. Schreiber, W. L. Handbuch der Holz- und Metallschnitte des XV Jahrhunderts von W. L. Schreiber. 8 Vols. Leipzig, 1928.